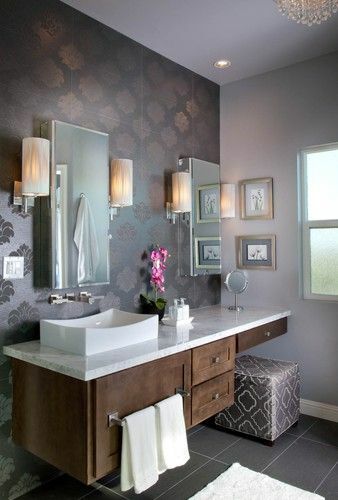 Since the vanity becomes one of the must-have furniture in every bathroom, it’s always a great idea to bring one to your bathroom. 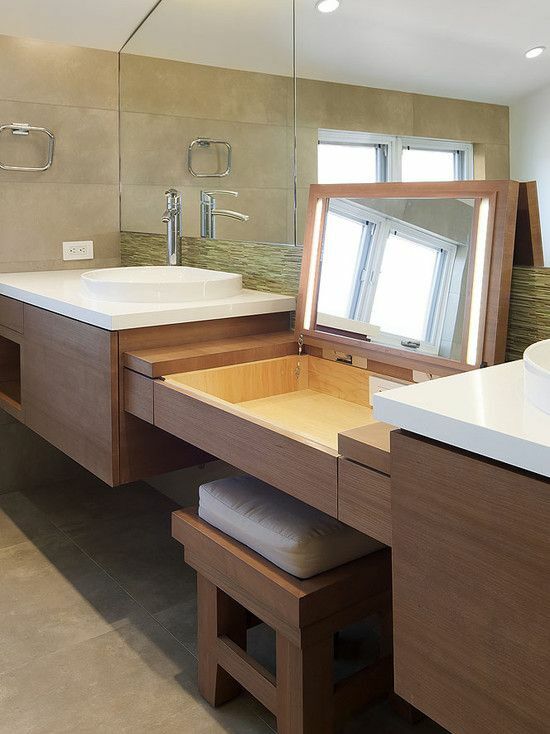 Today, almost every homeowner always includes a bathroom vanity to their remodeling list. 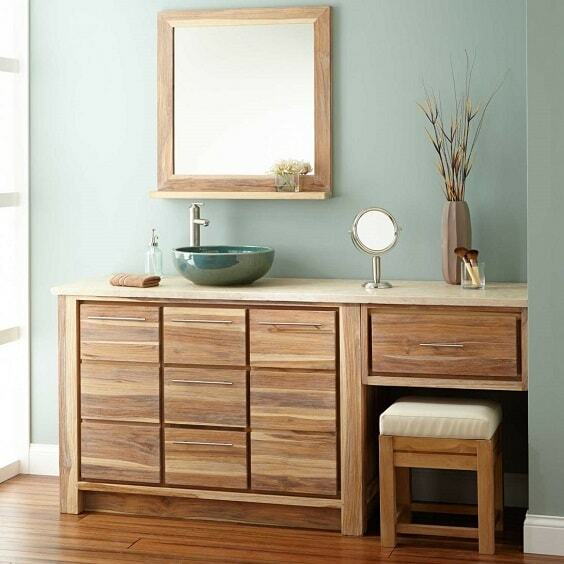 It’s so understandable because a vanity provides lots of benefits to support your daily needs. 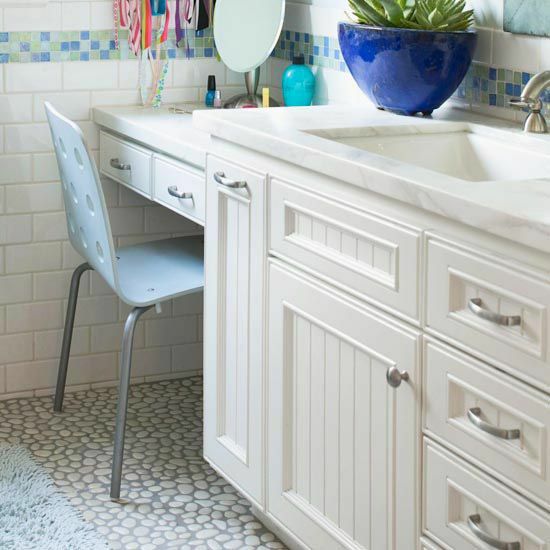 The first job of a vanity is obviously to provide the main convenient storage for your toilet stuff, and it also styles up the bathroom decor very well. Then, a vanity also becomes the spot for you to style up and get yourself ready before going to work or just going out. Therefore, having a vanity which provides the great comfort to put on some makeups is surely a much better idea. The bathroom vanity with makeup counter is kind of vanity which will ease your makeup times every single day. 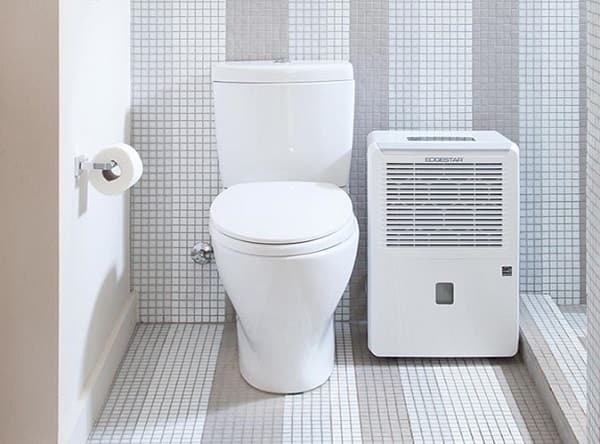 You can comfortably get yourself ready in your very own bathroom. 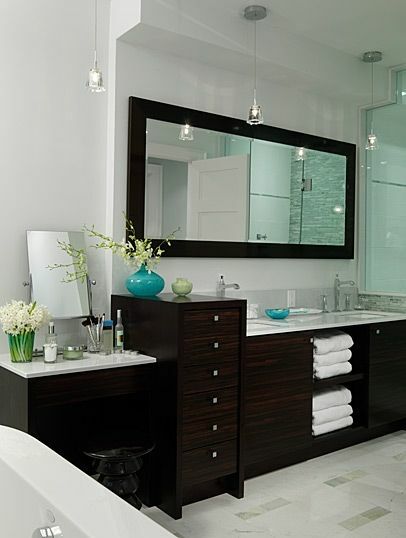 Here, we have lots of bathroom vanity with makeup counter ideas which are so worth to be your inspiration. 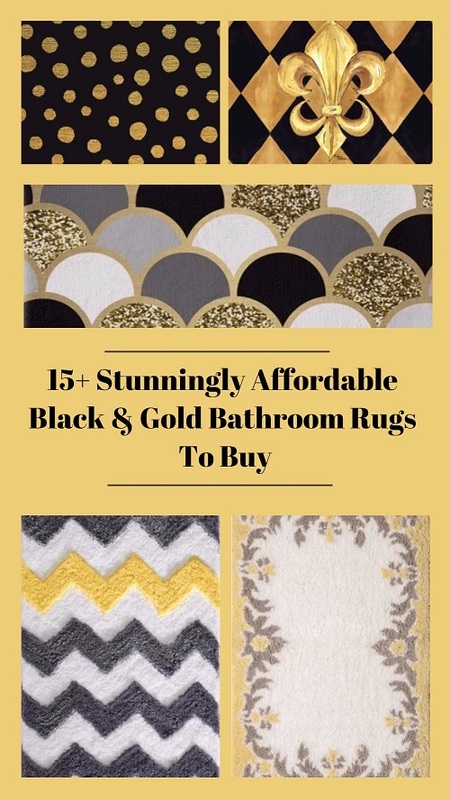 They will add a convenient makeups spot and bring the style of your bathroom to a whole new level at the same time. So let’s just keep scrolling to check out our best picks of the bathroom vanity with makeup counter ideas! The superbly stylish bathroom vanity with makeup counter in an all-white style with gold pulls and accessories. It comes with the makeup area which is installed on its side beautifully. 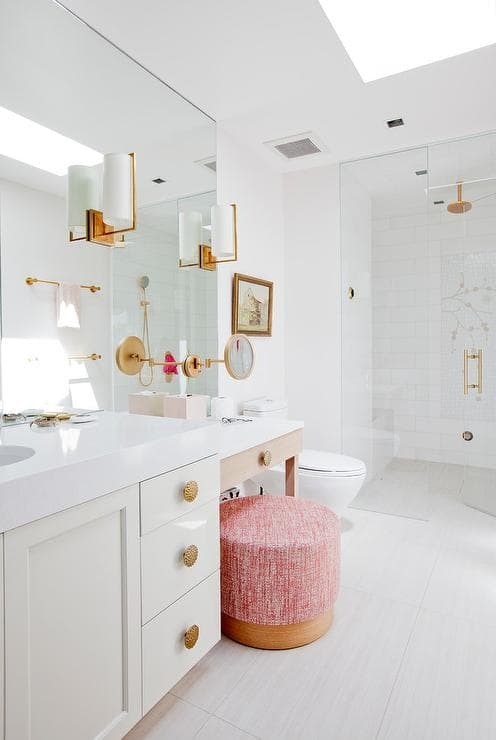 Then, the pink textured chair gorgeously pops up the color among this bathroom’s all-white layout. This one is a single all-white bathroom vanity with makeup counter with an L-shaped design which works well for a long narrow layout. The makeup area is spacious enough which effectively benefits the corner of the room. 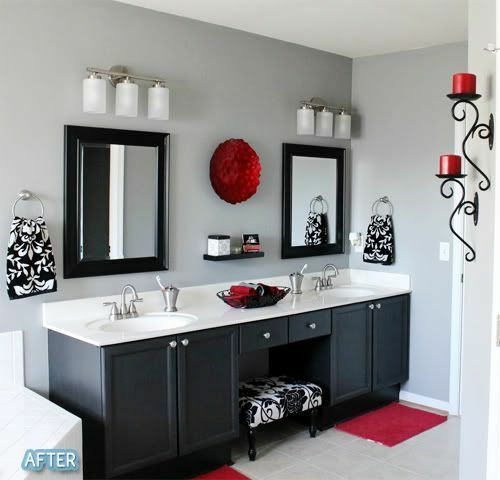 The bold-looking bathroom vanity with makeup counter with sleek black cabinet and clean-lined white countertop which will style up your bathroom decor very well. It’s built with the makeup are on the center which is enough to give you a joyful makeup time. Grey is always the best color option when you want to have a neutral-minimalist touch to your bathroom decor. 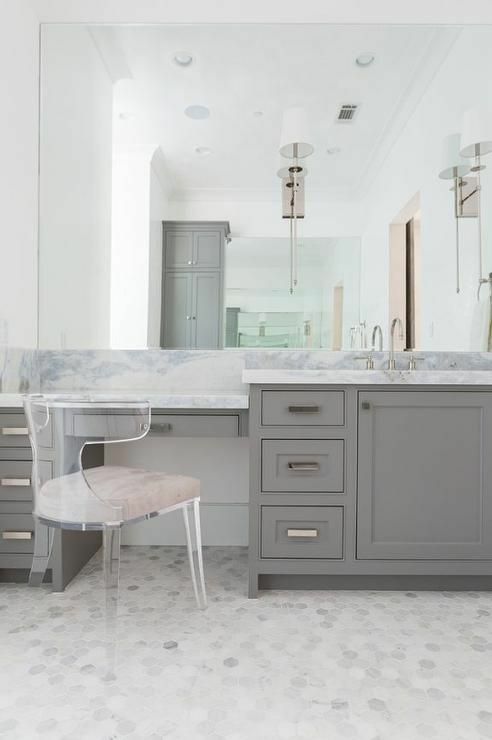 This bathroom vanity with makeup counter combines the modern gray cabinet with earthy white marble countertop stunningly. To give a more minimalist nuance, the single huge mirror is chosen instead of the double style. 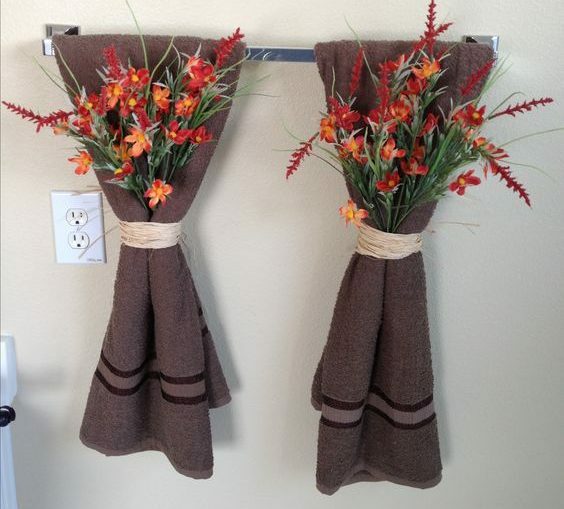 One of the latest bathroom trends today is adding a rustic touch to the overall look of the room. This one is a tempting bathroom vanity with makeup counter with the rustic design which looks more decorative with its wood-plank style cabinet door. 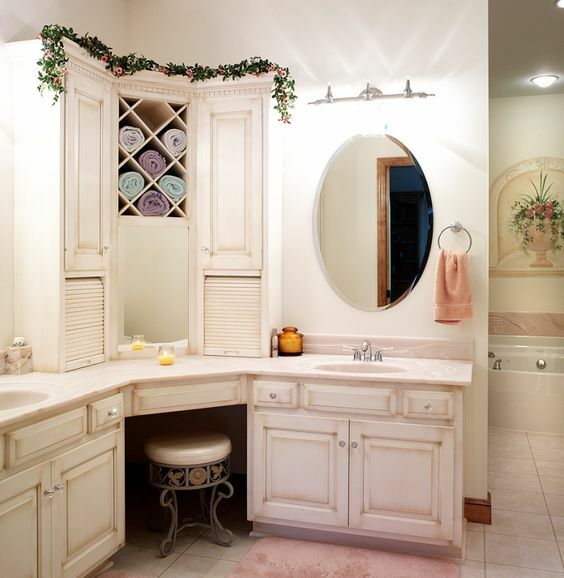 For you who have a spacious bathroom, choosing a double vanity is always a good consideration. 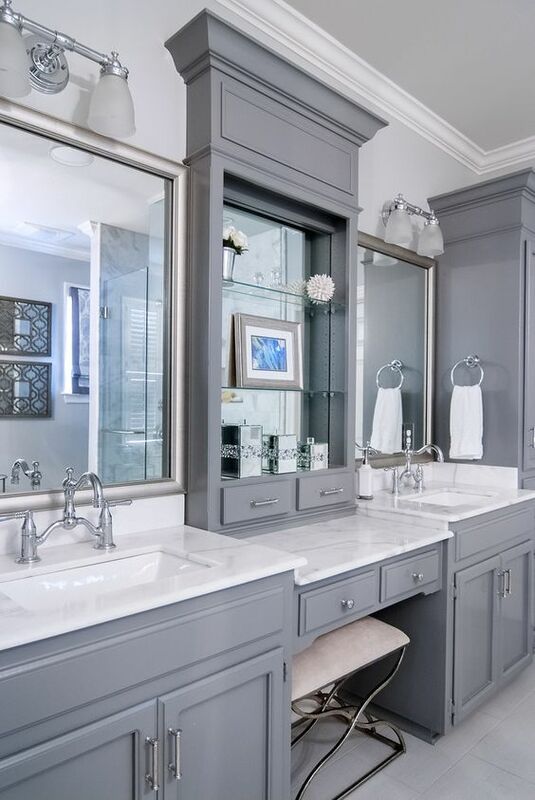 This bathroom vanity with makeup counter is so worth to include in your inspiration list with its simply admirable design. 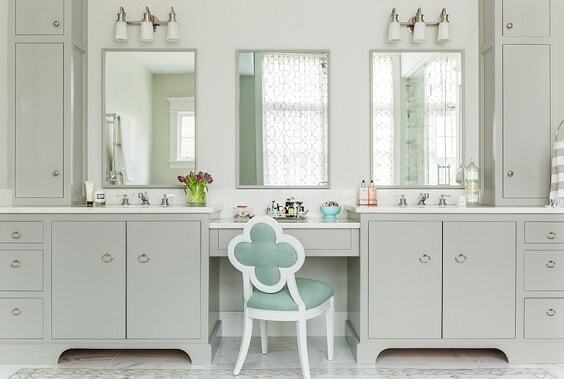 You can see how the mint-green stool beautifully colorizes the neutral finish of the vanity. If you don’t need a big storage to handle your toiletries, this bathroom vanity with makeup counter probably a nice reference for you. Basically, it’s not a real vanity, but just a makeup area with some drawers which enough to provide more functionality in your bathroom. Every French-style furniture will always make the room look classically glamorous, and this bathroom vanity with makeup counter is an inspiring idea for you who want to have the one with such design. 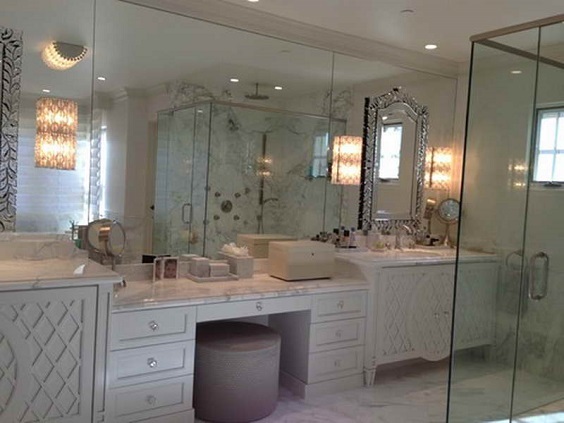 It consists of a double cabinet with sink and a makeup area in the center all in classy style. 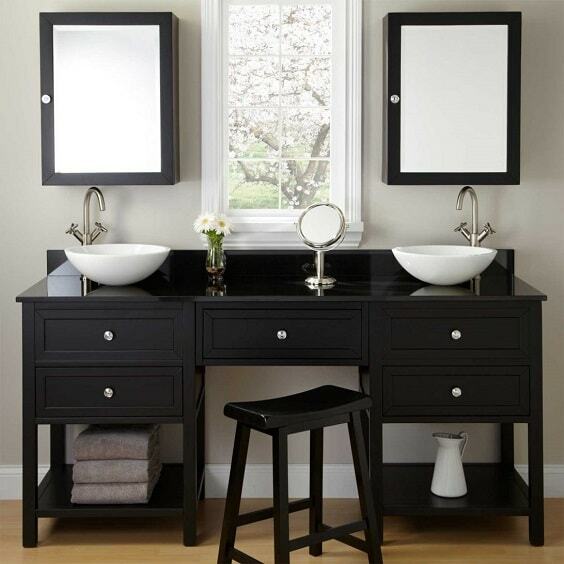 The elegantly bold bathroom vanity with makeup counter which is finished in black from ‘head to toe’. 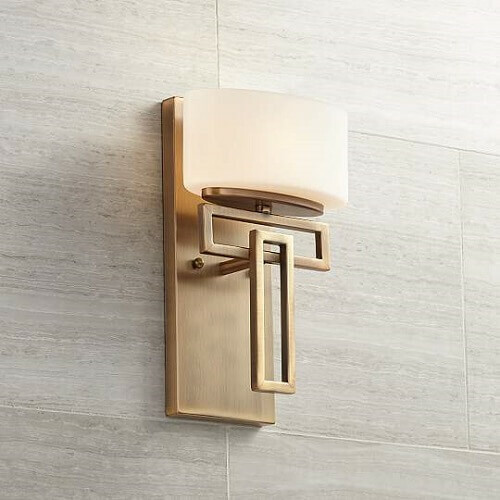 Here, the upper mount vessels and chrome pulls are the only stuff which adds a bright touch to the overall look of the vanity which makes it look so beautiful. 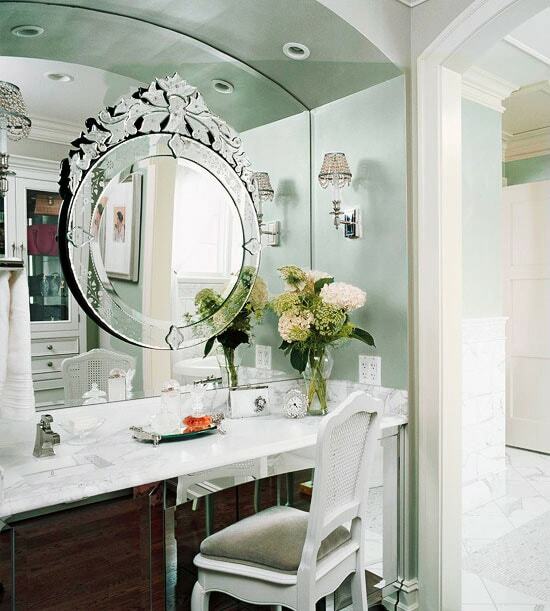 This bathroom vanity with makeup counter looks so stunning with its huge mirror and mirror accent in its table. 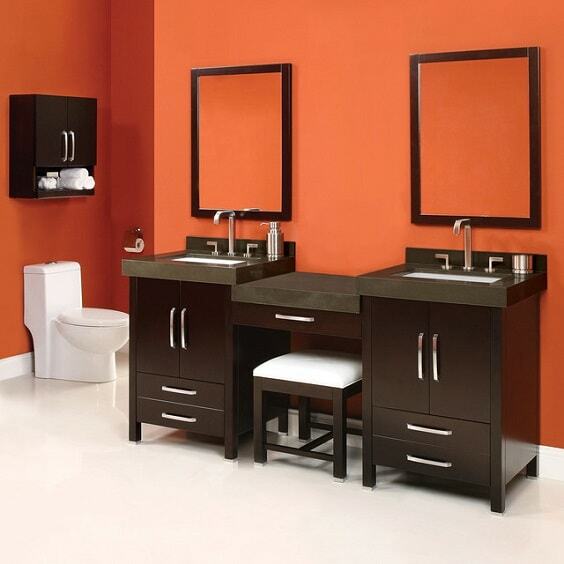 The design of the vanity construction is actually simple but totally enough to give you a convenient makeup spot. 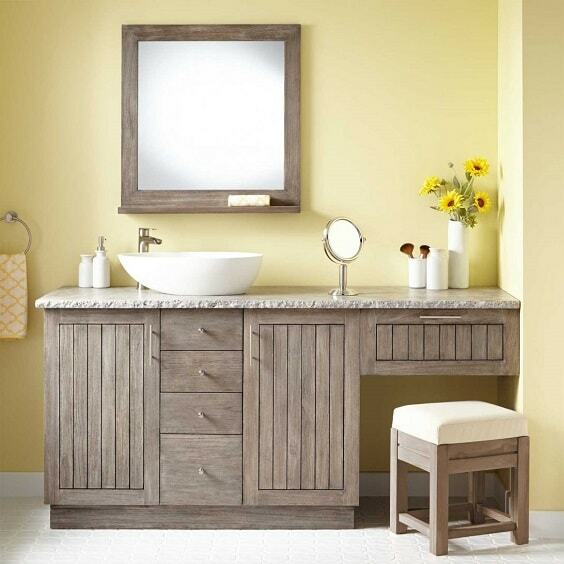 For you who have a farmhouse bathroom, this bathroom vanity with makeup counter can be one of the best inspirations. Its decorative cabinet doors become the main factor which gives the farmhouse touch to its overall design. The classically-designed wall-mount bathroom vanity with makeup counter which will become the main focal point of the room. There are only two simple drawers which work as the storage of this vanity complete with the golden towel holder. 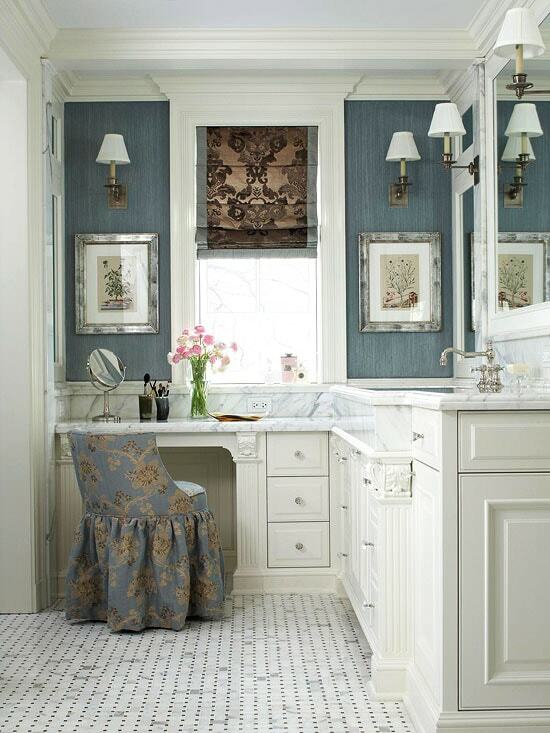 The long space underneath the vanity allows you to put a long cozy chair. The adorable bathroom vanity with makeup counter with a rustic overall look to complete your naturally inspired bathroom layout. It comes with a small makeup area on its side which is adequate enough to get yourself ready comfortably. Another L-shaped bathroom vanity with makeup counter which is so inspiring to copy and this one is completed with a corner tower storage. Therefore, it allows you to store more bathroom stuff conveniently without taking lots of spaces of the room. 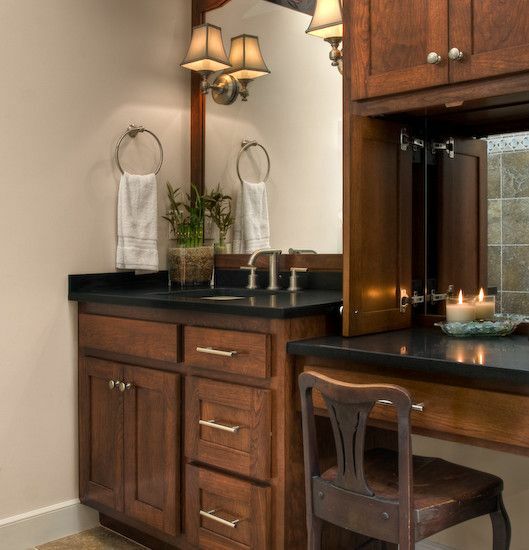 This bathroom vanity with makeup counter doesn’t only look so awesome with its elegantly rustic style but also provide a huge storage for your toiletries. It comes with the additional cabinet on its makeup area. 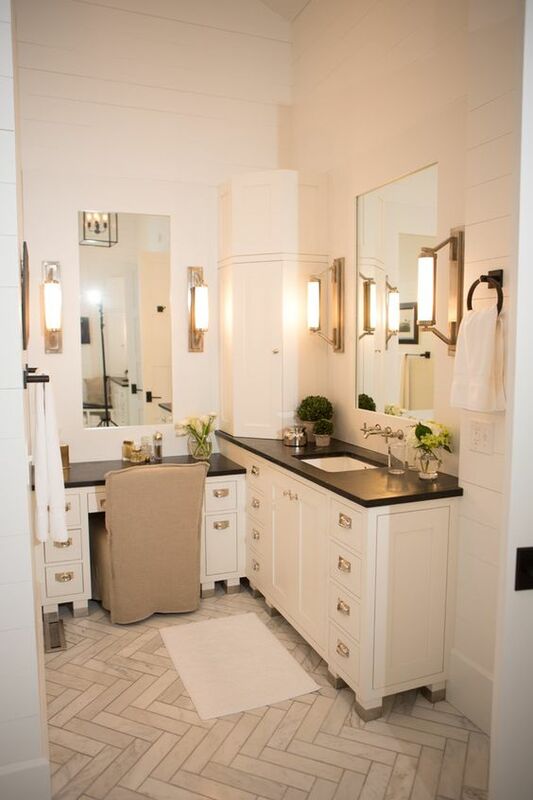 Another bathroom vanity with makeup counter with the farmhouse-style which is designed in a much simpler look. It’s all finished in white with the decorative wood plank door and the natural marble countertop. The gorgeous bathroom vanity with makeup counter with Asian-inspired design to give another style to your bathroom layout. It’s finished in earthy wood with the natural beige marble countertop which makes it look so attractive. An L-shaped bathroom vanity with makeup counter is always an ideal option to provide a big storage and makeup station without taking huge space. 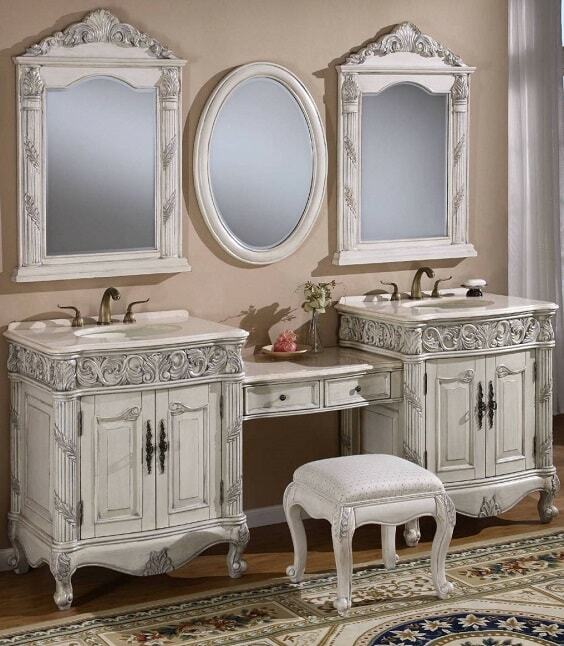 Here, the L-shaped vanity in the beige finish is completed with additional double counter storages perfectly. Moreover, an open tow rack is also added in the middle of the counter tower storage for a more convenient storage. This one is a combination of small single vanity with a long makeup station for you who are looking for a super comfortable bathroom vanity with makeup counter. It’s all finished in white so it doesn’t make the room look stuffy. The awesome bathroom vanity with makeup counter with the huge open shelf which is installed in its makeup area. 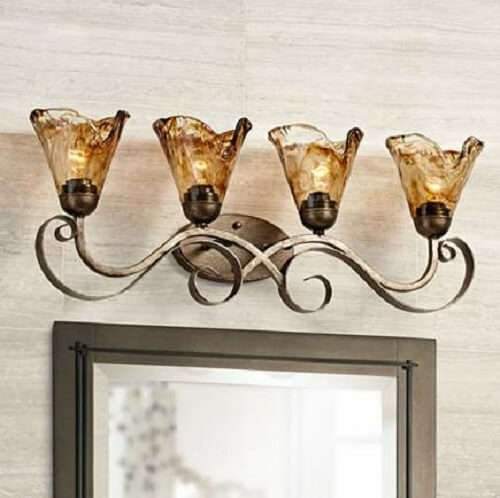 Since the mirror dominates the design of this vanity, it looks luxurious to style up your bathroom decor. The compact bathroom vanity with makeup counter which comes with the complete storages to deal with lots of your toiletries. Then, the door of its counter storage tower is completed with the mirror to ease you to get yourself ready. 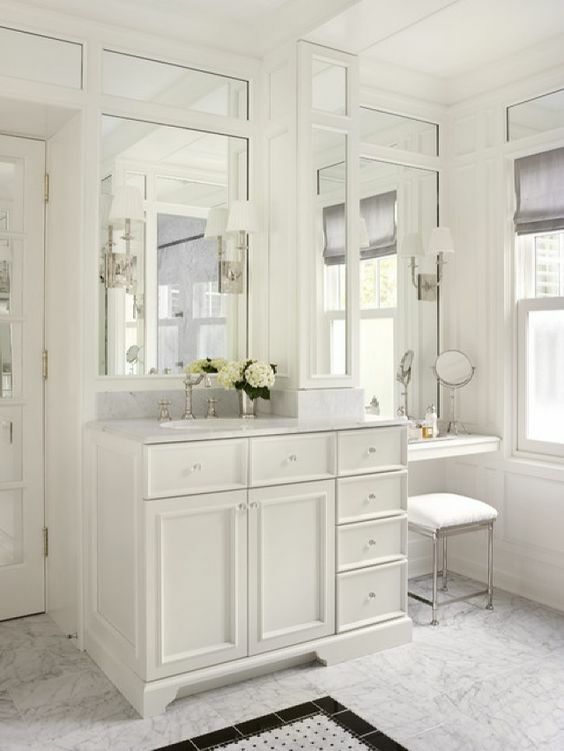 Again, an all-white bathroom vanity with makeup counter which is designed in an admirable traditional style. 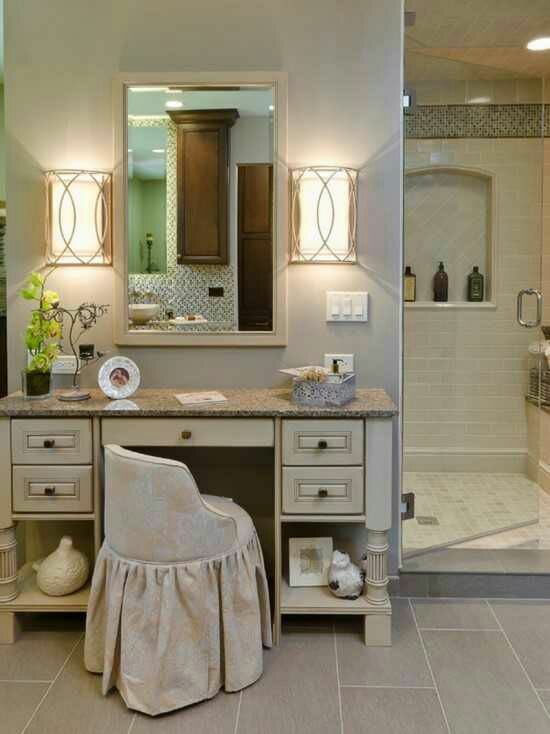 The makeup station is built in a drop-in style which completes the look and function of the vanity very well. The gorgeous all-white vanity with a sleek design which can be a good idea for you who have a tiny bathroom. It has a cozy makeup station and a nice cabinet. Another stunning classic vanity design which will remind you of the furniture from the Victorian era. The cabinet is finished in off-white and combined with decorative marble countertop which makes it look so old-fashioned. 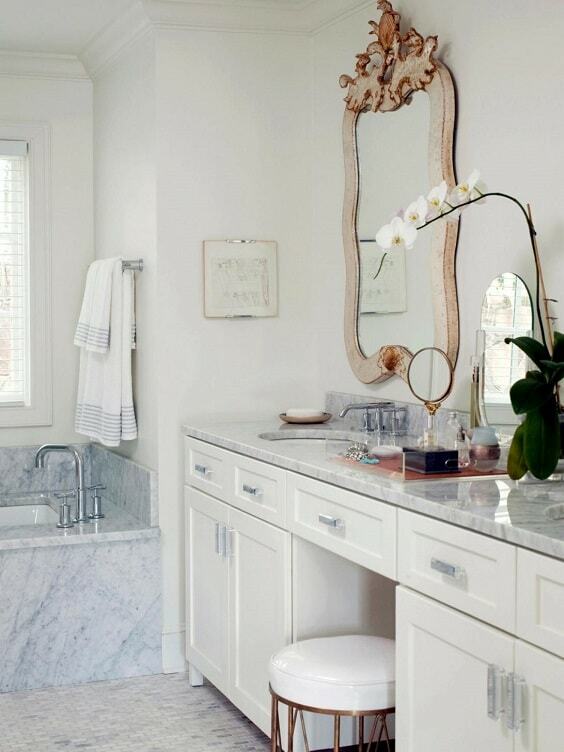 The beautiful all-white vanity which combines the clean-lined cabinet with the white decorative marble countertop. 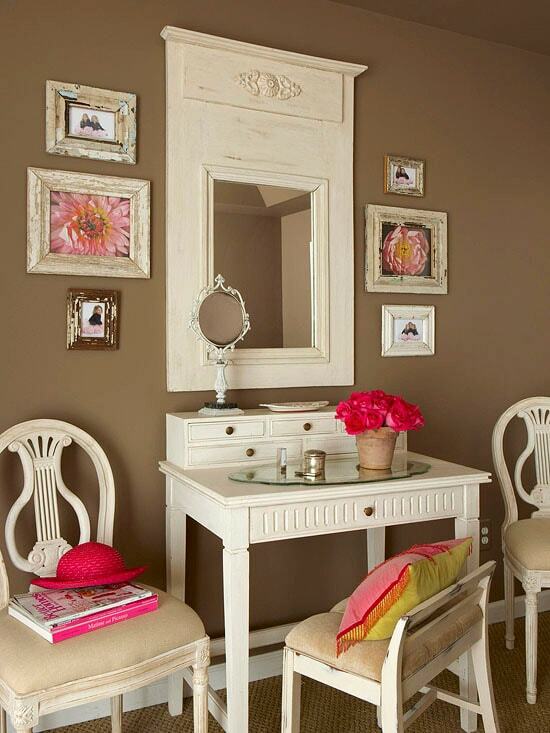 It matches well with the overall look of the room and colorized beautifully by the rustic classic mirror. The small L-shaped bathroom vanity with makeup counter which will perfectly save the space of your bathroom while providing a cozy storage and makeup spot. It comes with the gorgeous combination of white cabinet and plain black countertop. The finish of this bathroom vanity with makeup counter will add such a bold statement to your bathroom decor. 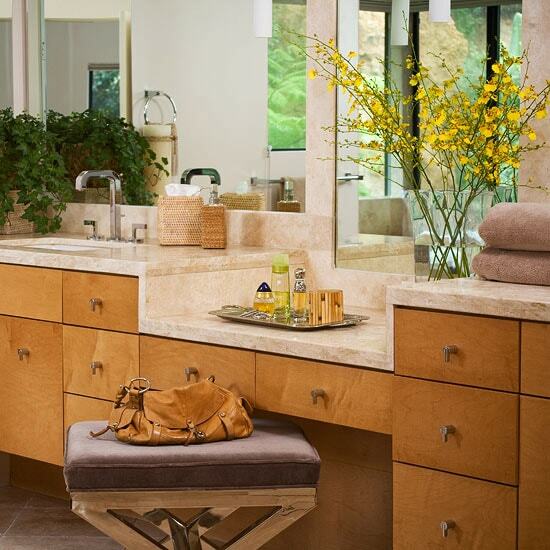 Then, the earthy stone countertop and modern chrome hardware give another style stunningly to its overall design. 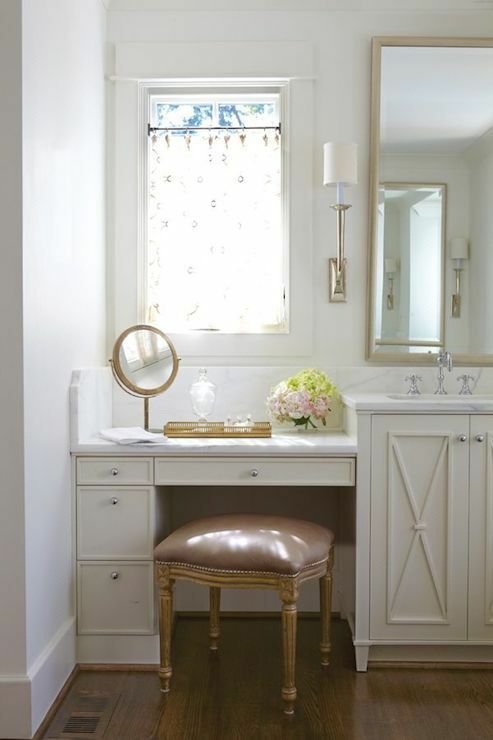 This bathroom vanity with makeup counter has such an element of surprise with its hidden mirror under the makeup table. The hidden mirror will help you to put on some makeup more conveniently as the addition to those huge mirrors. 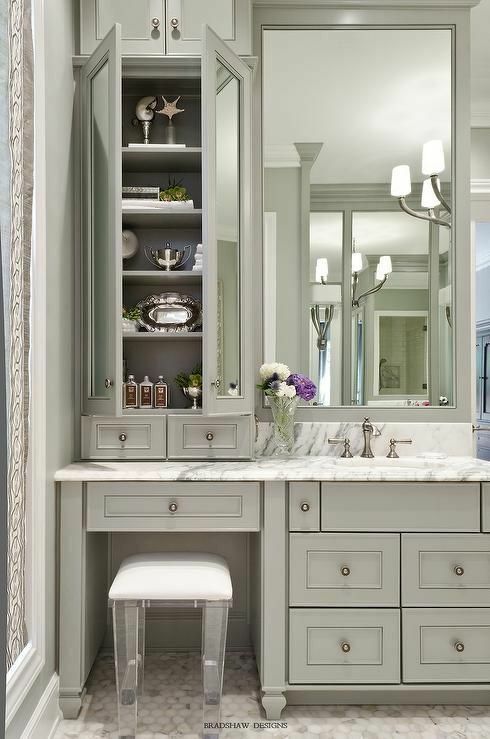 The long bathroom vanity which has all you need in one design; the cabinet with open and close shelf, a drawer tower, and makeup station. They all come in the dark rustic wood finish and white countertop which makes it work well both for modern or earthy bathroom layout. 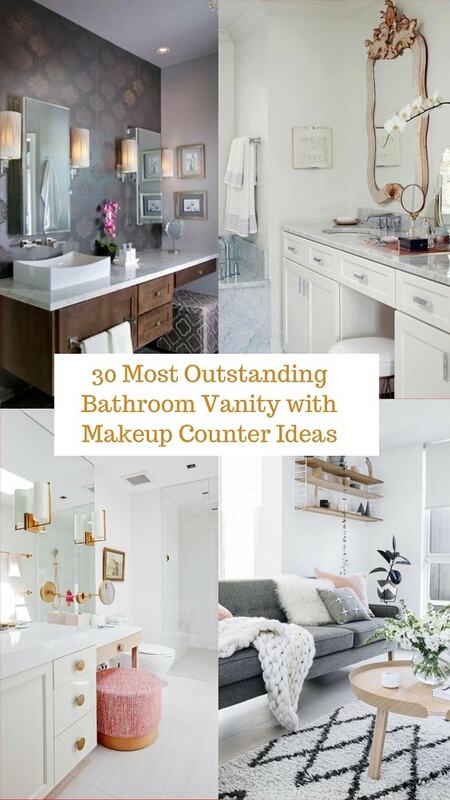 So those are some inspiring bathroom vanity with makeup counter ideas that you can use as the ultimate reference to copy. You can use the design of those vanities for the inspiration when you are about the bring one to complete your bathroom decor. 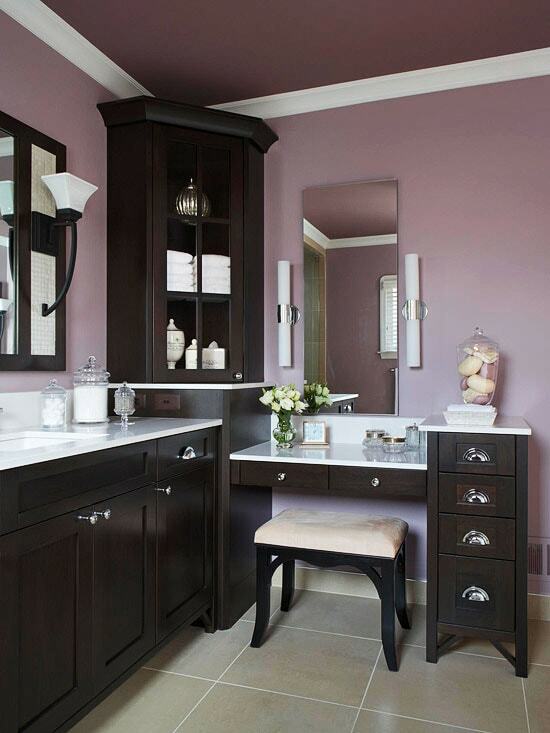 Choosing the bathroom vanity with makeup counter instead of the common one is surely a much better idea. 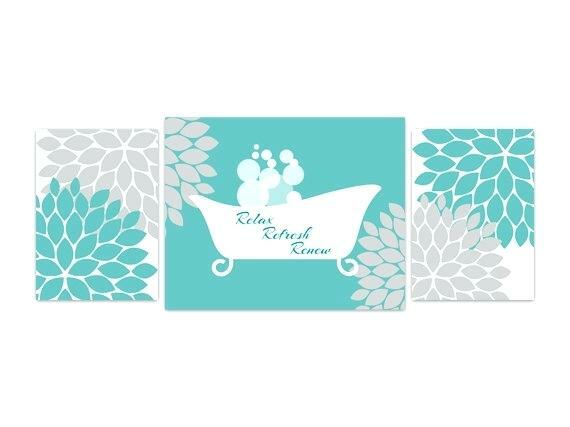 It makes your bathroom feels more pleasing and exhilarating to use. 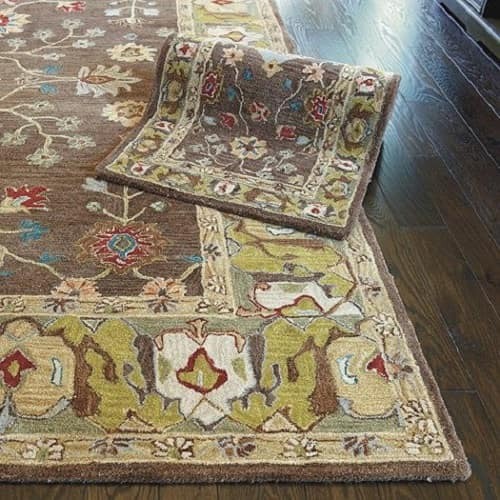 Pick the one that matches the overall existing layout of your bathroom to get a nice harmonious layout. 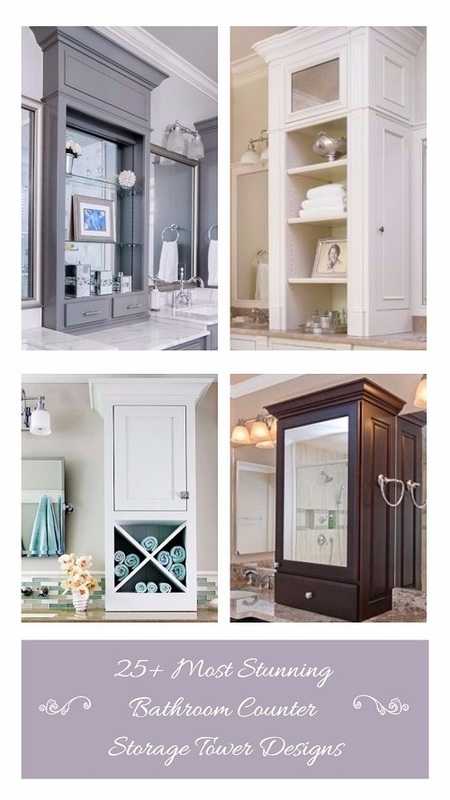 Also, determine the storage that you will need to deal with all of your bathroom stuff. 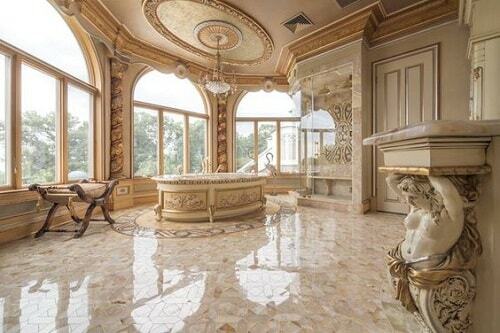 Well, happy remodeling your bathroom now!